We invite you to worship with us on Sunday. 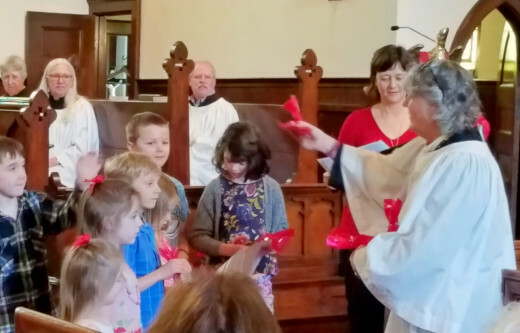 Sunday Service is held at 8am Holy Eucharist Rite I and at 10am Holy Eucharist Rite II with Choir and Children Christian Education. Come worship with us! 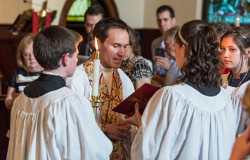 We are a liturgical Episcopal church that seeks by word and action to carry out God's work in the world. “Ultimately nothing is to be left outside the fellowship of the Holy Spirit.” The community gathers at 8am and 10am Sunday mornings for two unique services. Whether you enjoy the quiet, spoken service with the beautiful traditional language or the organ, choir and processions we have it all. 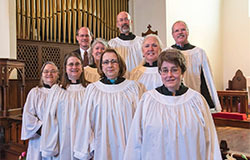 Whether you sit in appreciation as a member of the congregation, or you participate actively as a member of our terrific choir, there is no question that music is a central part of our worship and celebration of life here at St. James. Music sets the spiritual and joyous tone of our 10AM service with wonderful preludes. We encourage members of all ages to explore the mysteries of our faith. Traveling a path of spiritual growth is a wonderful and fun exercise, and it is our goal to provide inspiration and support along the way. To that end, we offer programs for all ages year-round and boast certified Godly Play teachers for our youngest members. 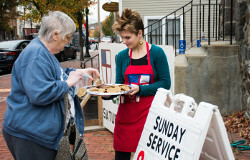 Our parish is engaged in serving the wider community and world. Whether you are looking for a onetime event, a short-term project, or ongoing ministry, St. James is the place to be! We have numerous ministries from feeding the hungry, providing warm clothing to those who are homeless, donating school supplies to under privileged children and much more. Read Fr. John's Sermons and Reflections.